Leveraging Assessment Practices to Motivate Student Learning with Jan Chappius. 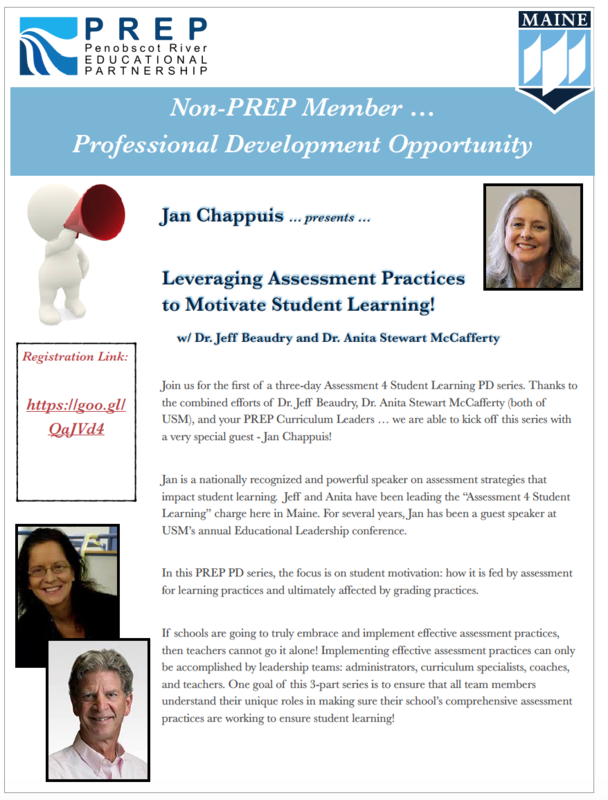 Co-leading this series of PD opportunities are Dr. Jeff Beaudry and Dr. Anita Stewart McCafferty both Educational Leadership faculty at the University of Southern Maine. PREP is delighted to be able to offer this opportunity to not only members of PREP but also to other area school districts. All sessions will be held at Jeff’s Catering in Brewer and will go from 8:30 – 3:00 each day. The sessions will take place on October 3, January 25, and April 26. To attend just October 3 the cost is $175 and to attend all three the cost is $250.